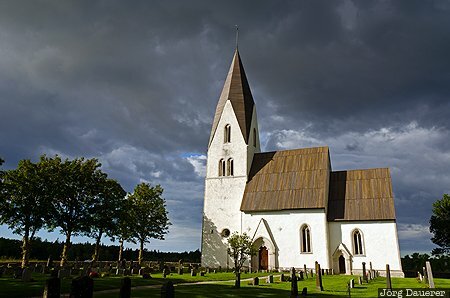 The medieval Tofta Church and the graveyard surrounding it illuminated by the low afternoon sun in front of dark clouds. Tofta is in the south west of the island Gotland in the Baltic Sea in the south of Sweden. This photo was taken in the evening of a cloudy day in September of 2014. This photo was taken with a digital camera.